Looking for a qualified reviewer to run it through its paces & report back.Demo board arriving next week - interested? One for you Eppo - Im thinking? "run it through its paces"
Ps say hello to terry Mctool next time ya out on the water in Swaziland. keen to try, anyone in vic going to bring these in? That looks awesome ! I'll definitely give it a go. Rode the Mako King a while ago and that was fun in the summer slop. Woah - very good spotting jplmain. Not much slips past you - hey!!! BRM are the guys that Mark Shinn acknowledges on the www.shinnworld.com site as the originators of the board. Mark admits openly that its the first board concept he has 'copied' (as such) and adds to its glamour by saying that he was "so stoked on the BRM Paipo" - that was sent to him to trial - that he had to make a SHINN version. Dont know if its different build structure but the SHINNSTER comes with all the specs of snowboard construction so may be quite different to a TT feeling ride. NB I also think he is mates with the Maui guys - so nothing untoward going on here. You will see the BRM logo on every Shinnster. All good. Some comments on the BRM Paipo and a comparison to the Mako King on Kiteforum. Sounds like the Shinnster will be some fun. One for you Eppo - Im thinking? I have a LF twinskim, guessing this be similar but maybe a bit grippier due to long straight rails and the finz. Does anyone know what price point they are looking at? Theyre in. Demos R GO. Good pricing on the Shinnster. I'll might try for Friday weather permitting. Will give you a ring. I wouldn't mind a try of that Shinnster Puppet, look's good. If u got the talent? Level = intermediate, 5 seasons and mostly on surfboards. One full season unstrapped. Managed to get a sneaky couple of hours on the water this afternoon on the Shinnster, and am pretty stoked with how it went. For background, I'm an ex windsurfer and 5 seasons into kiting, my local is Scarborough/ South Trigg in Perth. Im looking specifically for a board to use in light to average conditions, and already have a couple of surfboards and a 138 Twinnie. I've tried bigger TT's (Shinn King George, Mako King) and had a Sector 60 for a while too. First impressions are that the Shinnster looks like a snowboard with some nose kicker. It's pretty long and wide - 160cm x 46, and mostly quite flat. Rails are not sharp like I expected, but much more like a TT than a surfboard for example. It also has some thickness I didn't notice in the photos. Fitted the fins and gave it it's maiden wax, and headed down to Trigg which provided an unusual and slightly gusty NW'er with a reasonable swell. First priority for me was efficiency and early planing. 10/10 in this respect - I used my 12m thinking id be underpowered and was pleasantly surprised. the extra surface area over my TT and flat profile (versus a surfboard) made it easier to get going than expected. Shinn say it combines the planing efficiency of a light wind board with the versatility of a surfboard - I'd have to agree as to the first part. I also found it easy to ride upwind. I found myself standing much closer to the nose than expected ( as in I didn't wax that bit) but yep, it's kind of like a big TT if you want. Also can get skatey if you put too much front foot pressure and manage to unweighted the fins :) But you can also walk back and load up the rail and you've got as much grip as you'd want. So does it perform like a surfboard when it counts? I suppose, it doesn't quite offer the same grip as a thruster but nor should it. I had no problems catching a few waves and holding a rail, and also found it a cinch when dealing with whitewater on the way back out. Mark Shinn makes it look so easy - I have no skills in comparison, but the Shinnster goes backwards pretty well, 180 degree spin to toeside, all no problem. It's a pretty friendly ride at the end of the day. So in conclusion, and it's only based on 1 session, but on a day I expected to be pretty crappy and hard work, I ended up with a fun 2 hours on the water. And that was enough for me to place an order to get one. Give it a go I reckon. Kites from 2-3pm this arvo around Trigg and Scarbs. Had a bit of trouble getting out through the sets, but once out the back I could hold ground. The ocean reef graphs said 8-10 so I reckon Trigg was a bit under that. I'm pretty stoked about that board - definitely more bottom end that any of my surfboards. Diving the kite (not looping) was enough to get on the plane, and from there the S321 could sort the rest out. Pulls like a truck that thing. And the Shinnster is super smooth...... Unlikely combo but it works. Hi Phil as mentioned I'm ready to pull the trigger on this puppy. Understand you need to get 5+ purchases to get a ex-stock delivery. People contact KiteSurfSup if your interested in purchasing the Shinnster before September release. Thats if they are available? Still waiting to hear. 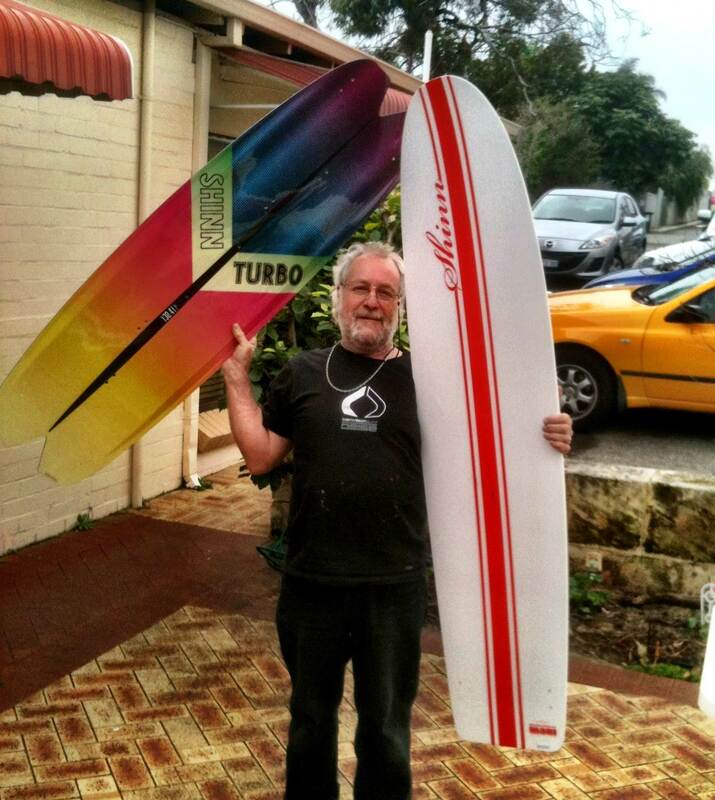 Mark has been overworked on some exotic island somewhere testing the new board releases - tough life. Sorry all - been off the planet for a week. Want a demo of the Shinnster (or any Shinn) give me a call - 0430 966 397 - back in range 24/7. My thoughts on comparing with a SB after 2 weeks travelling with a Shinnster and BWS Drifter. Background : intermediary, dedicated to surfboarding, trying to balance time on water and family. Build : basically a long TT with flex. No maintenance, light, no ding worries, adds great protection in the bag on top of the surfboard. Can see me handing it down to my kids and probably grandchildren. In that context great value for money. Where I preferred using it : great in flat or chop - it just glides through. Without floatation like a SB its less forgiving in transitions - shinnster encouraged me to concentrate more and move my feet around the board more, which should improve my SB skills. Waves - in 1.5m - a different, more loose feeling. Fun but wouldnt want to be in much bigger waves with it. Again, the different technique must be beneficial to improving my overall skill. Tricks - not my thing, but alot of good TT guys on the beach asked to take it out and loved it - especially in the flatter lighter conditions. Feedback from them was it was a good lightwind compliment to their TTs. Motivates me to be more adventurous in my kiting. Wind range : seemed to have similar low end and no trouble in 30kts. Happy using a 12m or 7m sizes. In fact for bombing along in the flatter wind chop water is was more controlable/enjoyable, no bounce. Conclusion : much enjoyed having both to hand on this trip (Sri Lanka and Maldives). Whilst I will always want to be on the SB in waves, this certainly adds a bit more interest to a wider range of sessions. A cheap, hardy, long life addition. Can see it being a good duo with a more extreme surfboard than the drifter. Whilst before I would only bother if conditions were pretty good for SB, I can also see myself getting a lightwind kite now.